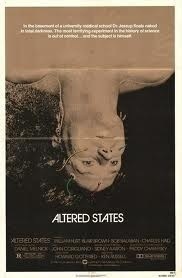 “Altered States” is a movie I’ve known about for quite a long time, yet never gotten around to seeing. 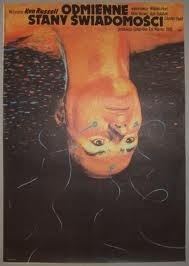 I didn’t know too much about it, though the iconic poster art always stuck with me. 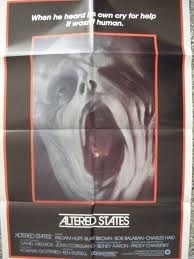 I remember seeing it constantly in the 5$ bin at HMV when I worked there, though I can’t recall anyone ever buying it. Though not strictly horror, I felt it was time to finally give it a shot. 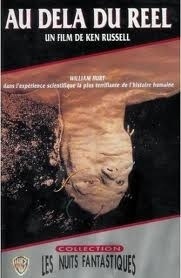 The film is about an intelligent (but eccentric) university professor who becomes obsessed with a sensory deprivation chamber. 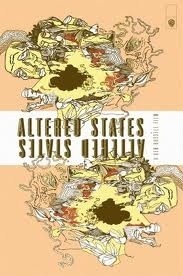 Exploring his theories about mans origins, he travels to Mexico and brings back an untested drug. Combining the drug and the chamber, he begins to make startling discoveries about his very being. The cast is quite good, as expected. This was William Hurt’s first role and he is excellent as the increasingly erratic professor. This was also Drew Barrymore’s film debut, though I don’t remember seeing her. Bob Balaban is also excellent as Hurt’s dope smoking college, though its strange to see him in a dramatic role after so many Christopher Guest films. This was a very interesting movie. I literally had no idea what to expect from it, so it was difficult to be completely let down I suppose. 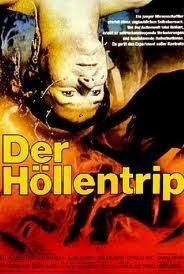 Clearly a lot of this film hinges on the effects, and they are more or less well done. It WAS 1980 however, and several of the (primitive) CGI effects are just that, primitive (no pun intended due to the subject matter). 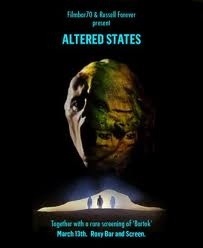 At times I felt like I was watching “The Lawnmower Man”. Harsh, I know. The idea that our past lives are still part of our genes lying dormant within us is an intriguing concept. 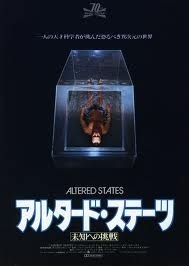 Obviously it’s a wild concept, but it’s a great hook for a sci-fi/horror premise. The longer Hurt stays in the tank the more unhinged he becomes, steadily losing his grip with what we perceive reality to be. Arguably the best sequence in the film involves Hurt (who may or may not be gradually regressing physically) turning into a caveman and brutally attacking two of his colleagues. He manages to escape the lab and wreck havoc at the local zoo, devouring one of the animals before reverting back to human form in the morning. Certainly a werewolf aspect at play there. 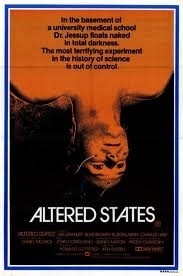 “Altered States” was adapted (by the author himself) from a hit 1978 novel which was never followed up. The writer clashed with the director constantly, despite having his script remain largely unchanged. 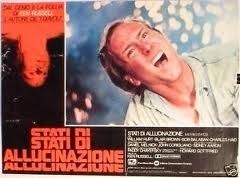 This lead to him eventually disowning the film (before seeing it) and using an alias to distance himself even further. While its easy to understand a writer being jerked around by Hollywood, this appears to have been one of those times when the writer himself was nearly as eccentric as the main character in his book ! I had no problem with the screenplay itself, if anything I’d place any complaints at the feet of the effects artists, but hey, they did pretty well for 1980. 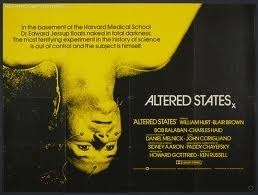 In the end, I did enjoy “Altered States”, and it’s premise maintained my interest and kept me guessing. 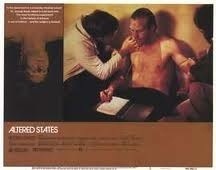 By the end I genuinely wanted Hurt and his wife to survive, certainly a testament to their portrayals. While I never need to watch it again, it’s certainly worth checking out once, just don’t take any untested Mexican drugs first. 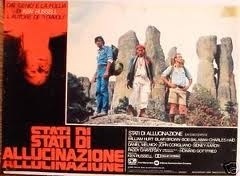 This entry was posted in Reviews and tagged 2012, 80s, Barrymore, cgi, chamber, Christ, cult, drugs, gore, Halloween, hallucination, hell, Horror, hurt, madness, school, Sci Fi, science, states, thriller, violence by lazron. Bookmark the permalink.